This Friday, the U.S. Bureau of Labor Statistics will release employment data for the month of November. After only 18,000 jobs were added in September and numbers rebounded in October, economists project that approximately 190,000 jobs were added in November. Additionally, economists expect the unemployment rate to remain at a low of 4.1 percent, nearing the pre-recession low of 3.8 percent experienced in April 2000. Due to increasingly low unemployment rates, some economists have argued that the United States has reached full employment. 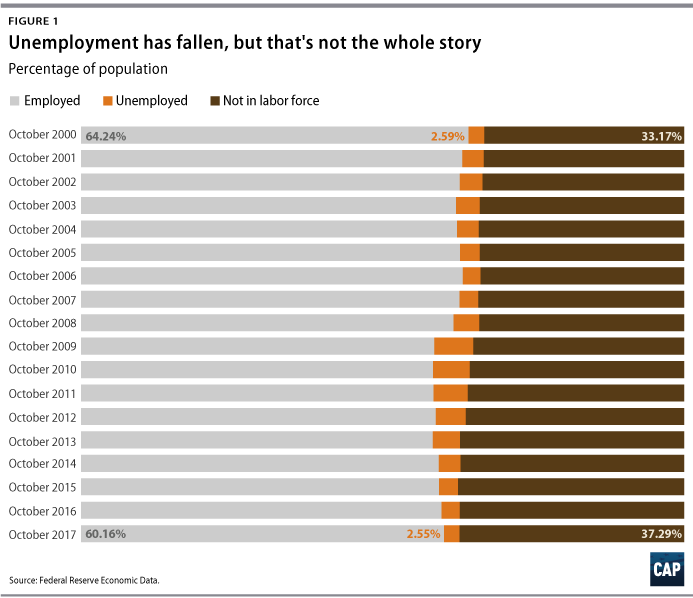 However, their argument neglects the fact that a larger percentage of the population is out of the labor force today than before the recession, as shown in Figure 1. This suggests that it is too soon to declare a full-employment economy and that raising interest rates could do more harm than good. The data release comes just days before the Federal Open Market Committee meets on December 12 and 13, and many investors anticipate a December hike in interest rates. Whether or not this occurs likely depends on what the November data say. A low unemployment rate in November, however, is insufficient evidence that an interest rate hike is necessary. A tight labor market disproportionately helps those facing the greatest challenges in the labor market, such as individuals experiencing long-term unemployment. Keeping the interest rate low could help many of these individuals re-enter the labor market. Additionally, although unemployment is low in the aggregate, it varies regionally and demographically. For example, the unemployment rate for non-Hispanic blacks remains approximately twice the rate for non-Hispanic whites, and the unemployment rate in the South is higher than it is nationally. In previous columns, we have highlighted the state of the economy for fathers, teens, black women, and Latinas. This column will focus on the economic differences across U.S. regions and states. Last month, The Hill announced that 13 states­—including Alabama, Hawaii, Maine, Mississippi, Tennessee, Texas, and Washington—had historically low unemployment rates in the October jobs report. The reasons behind these low unemployment rates, however, can be misleading. For example, although Tennessee’s unemployment rate has decreased, its prime-age labor force participation rate remains below the national average. (see Table 1) Because one must be actively searching for employment to be included in the unemployment statistics, the combination of low unemployment and low labor force participation rates that exists in some states indicates that many people are likely giving up their job searches and thus leaving the labor force. 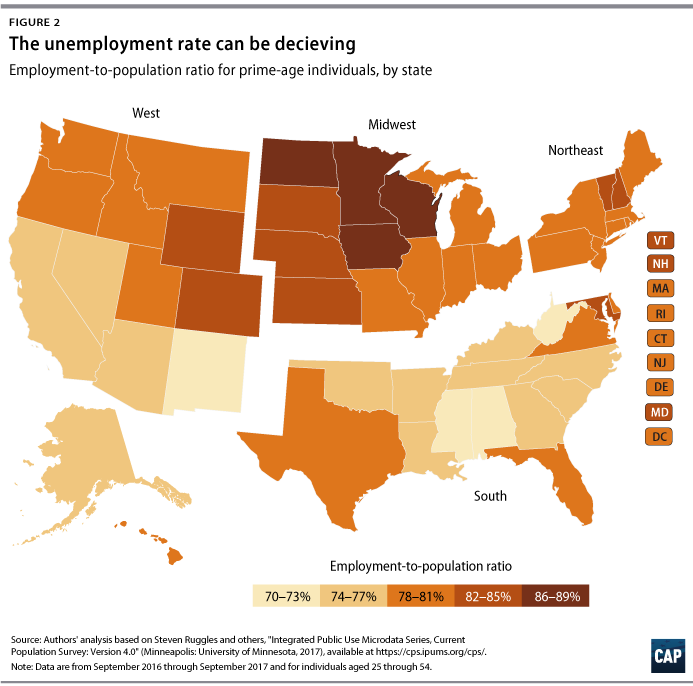 The prime-age unemployment rates in the states highlighted in the table below—including Arkansas, Florida, Michigan, New York, South Carolina, and Tennessee—can all be characterized as deceiving, as they are coupled with prime-age labor force participation rates that fall below the national average. Since the unemployment rate does not always tell the whole story, the employment-to-population ratio can be a better indicator of how an economy is doing. The employment-to-population ratio, also known as the employment rate, is equal to the labor force participation rate minus the unemployment rate and indicates the percentage of the population that is employed. The map below shows that the prime-age employment rate is lowest in the South and West and highest in the Midwest. This makes sense considering that, compared with the other three regions, the South has had the largest decline in prime-age employment rates since 2000. It’s important to consider how different demographic groups in a region are doing economically. For example, prime-age non-Hispanic whites and Asians are the driving force behind the Midwest’s high overall employment rate, and both demographic groups do better economically in the Midwest than in other regions. 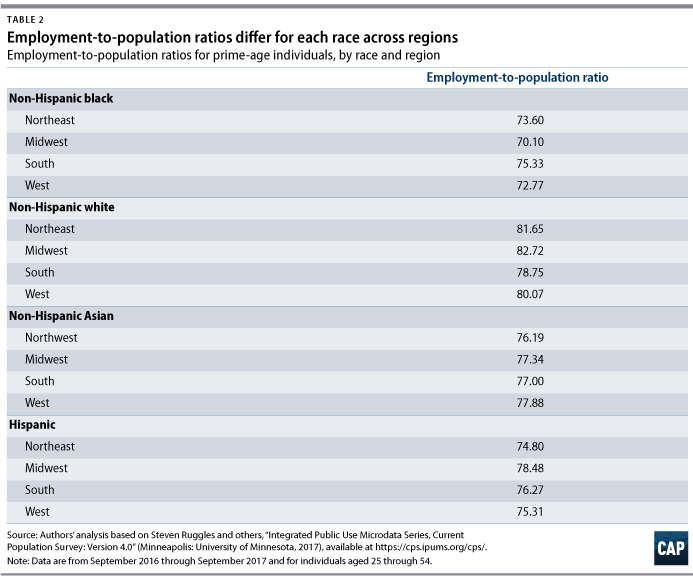 However, prime-age non-Hispanic blacks living in the Midwest have the lowest employment-to-population ratio—approximately 70 percent—compared with non-Hispanic blacks living in other regions. There is a nearly 13 percentage-point difference between non-Hispanic black and white prime-age employment rates in the Midwest—the largest discrepancy of any region. The smallest gap exists in the South, where it is slightly more than 3 percentage points. Although employment levels are important indicators of the state of the economy, wage growth must also be considered. For example, while the Midwest has the highest prime-age employment-to-population ratio, it has also had the lowest wage growth for prime-age individuals since 2000. 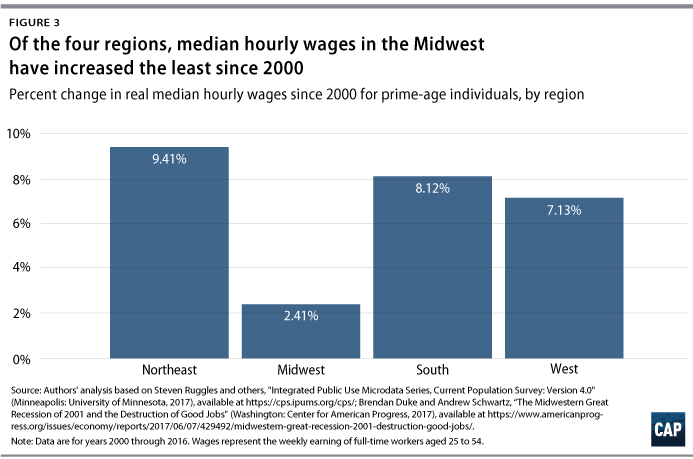 While wages in the Midwest increased by slightly more than 2 percent from 2000 to 2016, wages in the West, South, and Northwest all increased by more than 7 percent. 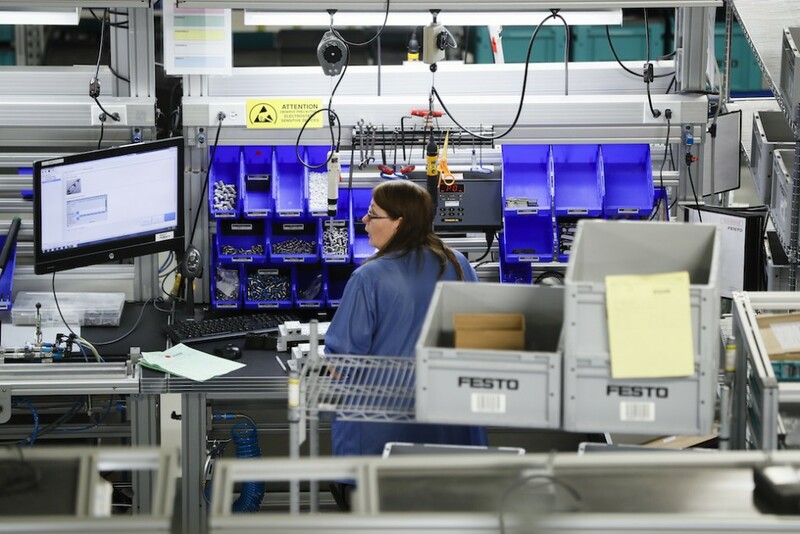 The Northwest experienced the highest increase in wages since 2000 at over 9 percent. 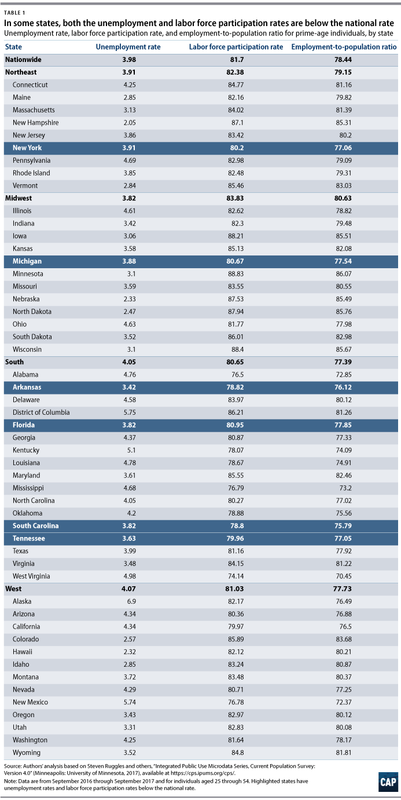 Overall, the Midwest has the highest employment rate and the lowest wage growth, while the South and West have the lowest employment rates but the highest wage growth of the four regions. This demonstrates that each region has slightly different problems to tackle in order to achieve a healthier economy. Additionally, each region must look at economic indicators across demographic groups to ensure that all demographics are benefiting equally from their respective region’s economic successes. Friday’s employment data will provide an updated snapshot of the U.S. economy and labor market performance. Although the headline unemployment rate—otherwise known as U-3—is an important indicator, the employment-to-population ratio may be a more effective marker of the health of the economy. It is important to understand the different economic outcomes that exist across regions as well as across demographic groups within each region. Although the economy is doing well in the aggregate, more work needs to be done to bring more individuals back into the labor market. If the Federal Reserve decides to raise rates next week, individuals with the greatest difficulty entering the labor market may struggle even more to re-enter the workforce. Annie McGrew is a special assistant for Economic Policy at the Center for American Progress. Kate Bahn is an economist for Economic Policy at the Center.